Shrimp and Grits is an old Southern favorite with as many variations as there are cooks. This is my simple version. It is great as a light supper or a filling breakfast. This was a quick and easy supper for me and my husband while we were by ourself last month. The shrimps for this were simply sauteed with garlic as referred to in the aioli recipe below. The only twist this time is instead of being served with pasta, it is served with grits. Any die hard Southerner will tell you to never use instant grits. Buy the real, corn grits (yellow or white), preferably medium milled. My mother-in-law taught me how to cook grits this way – the grits/water ratio should be 1/3 or close to it. That means, for every cup of grits, you should have at least three cups of boiling water. A cup of grits will probably be enough for five to eight people, depending on how much they can eat. For my husband and I, about 1/4 cup of grits is enough, so I usually boil about a cup and a half of water. I know, the ratio is not perfect, but like I said, it should be close to it. Besides, one and a half cup of water is easier to measure out or approximate than one and one fourth. Anyway, lightly salt the water and bring to a boil before adding the grits while stirring to prevent them from clumping up. Let it boil for a couple of minute while stirring then lower the heat to about medium and let it simmer for about five to ten minutes until the grits are tender and the water is reduced and the mixture should be a little thickened. Stir occasionally while it is cooking so it wont stick to the bottom of the pan or clump up. If it’s too dry, you can add more water. When it has thickened slightly but not totally dried out, you can lower the heat to the lowest setting and cover. Leave covered under low heat while you do other things for about 15 minutes. Stir to mix well before serving. Some people put cheese or butter on their grits, and I do too sometimes. It’s just this time, since I’m serving it with garlicky, buttery shrimps, I chose not to add any other additions. 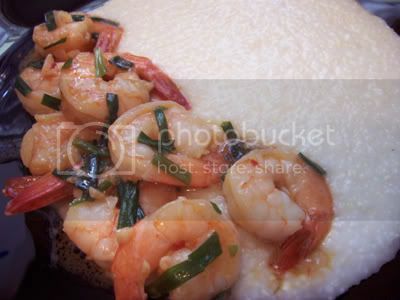 If you choose to mix in the shrimps into the grits before serving, that will be ok too. I just chose to mix them together after I got them on my plate. i have still here a pack of shrimps, i try this recipe…. Hi purple girl! you’re welcome 🙂 I hope my grits cooking method works out for you. We are the opposite then. I have been eating grits long before I learned it was a southern dish. I just thought all americans ate grits lol! oh my gosh, that looks sooooo yummy. i’ve been hooked on shrimp and grits ever since we went to Charleston SC a couple of years ago. before then, i was never into grits even after living here in the south almost all my life. i am so glad you posted about how to make grits. i have some good Anson Mills stone ground grits that’s been sitting in my fridge because it didn’t come with instructions. you’re a life saver.